CMAT 2019: The registration process for both Common Management Admission Test (CMAT) and Graduate Pharmacy Aptitude Test (GPAT) will commence on November 1 and will continue till November 30, 2018. This year, the National Testing Agency (NTA) will conduct the examinations on January 28, and the admit card will be available for download from January 7, 2019. The results for both the examinations will be declared on February 10. - Final year students of Graduate Courses (10+2+3) whose result will be declared before commencement of admission for academic year 2018-19 can also apply for CMAT online exam. Over 3500 AICTE approved B-schools are expected to take CMAT scores including JBIMS, Sydenham, KJ Somaiya, IMT and GIM among others. Both the overall test score and the individual sectional scores will determine the result. Those with high overall scores will get better ranks. Ties will be decided based on the performance of the students in the individual sections – those who scored better in quant will get better ranks. CMAT is a national level entrance examination conducted every year for admission in all management programmes. The duration of the computer-based online test is three hours and it is carried out in a single session. Candidate’s ability across various segments like quantitative technique, logical reasoning, language comprehension and general awareness are evaluated. The Exams will go fully computer-based, under NTA, in order to make it more accountable, minimise incidences of paper leak and come at par with international standards of assessment. Every student will get the opportunity to attempt the examinations twice to avoid drop-year cases, which could have been due to any unavoidable circumstances like an accident or sickness/disease. Students will be able to go practice mock tests from August-end at examination centres, free of cost. The results will be able to be processed faster and more efficiently. Major examination reform, NTA, is now operational. It will be conducting the NEET, JEE mains, NET, CMAT and GMAT examinations effective this year. Announcing the schedule of National Testing Agency, the new arrangement made by the MHRD will garner a lot of benefit to the students of the country. The candidates who would appear for these tests will be able to use the best score from the multiple attempts during the counselling process. It will also curb paper leaks and it will all be computerised. Javadekar also informed that neither the syllabus nor format of these examinations will be changed, not even the nature and the kind of questions. Only the method of taking the examination will change. It will all computer-based and conducted in online mode. 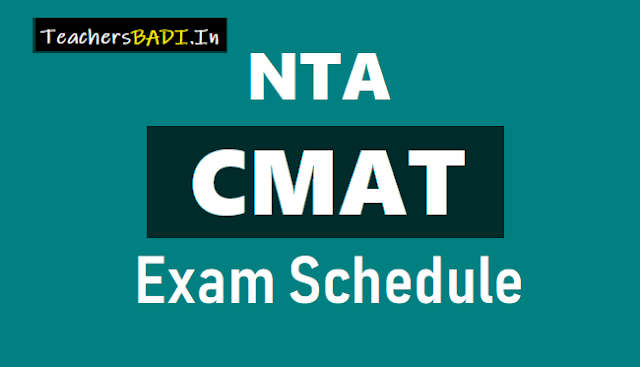 Other than this, CMAT and GPAT examinations, formerly conducted by AICTE would now be organised by NTA. Common Management Admission Test (CMAT) is a national level entrance examination conducted by (AICTE) every year as per the directions of Ministry of HRD and this test facilitates Institutions to select suitable graduate candidates for admission in all Management programs. Graduate Pharmacy Aptitude Test (GPAT) is another national level entrance exam conducted by AICTE and this test facilitates institutions to select suitable Pharmacy graduates for admission into the Master's (M.Pharm) program. Alll these examinations will now strictly be computer-based. The paper-attempting method would be shifted from manual/ handwritten to completely in online mode. The bold initiative of computerisation of these major examinations has been taken in order to make them leak-proof. Also, to bring these examinations at par with the level of international examinations like GRE and GMAT, which also allow multiple attempts to the candidates and thereby, select the best score. The news has come as a big relief for students as this would prevent drop-year cases for many such students who had to miss the examination due to unavoidable circumstances. The NTA would conduct the Common Management Admission Test (CMAT) and Graduate Pharmacy Aptitude Test (GPAT). All these exams would be computer-based and that students can practice at home or at authorised computer centres free of cost. The details of such centres would be announced soon. The syllabus, question format, language and fees won't change. Each exam will be conducted on four to five dates. The exams will be more secure and at par with international norms. There will be no issues of leakage and it would be more student friendly, open, scientific and a leak-proof system. These examinations will use highly secured IT software and encryption to ensure delivery of tests just in time. This will ensure no leakages and other malpractices.